As one of electronic devices manufacturer, Ricoh understand that each year, the needs for electronic devices keep on increasing, especially in offices and businesses. One of the most significant increase is the need for copier machine. 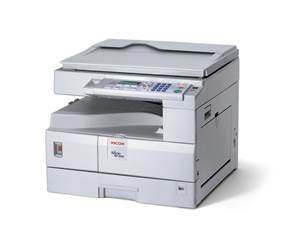 To accommodate this demand, Ricoh released Ricoh Aficio 2016. This machine offer the function of copier and printer in one device. The copying process include electro photography printing and twin laser beam scanning. The maximum paper size that can be handled by this machine is A3 paper. For the maximum printing resolution, Ricoh Aficio 2016 is quite average, with 600 x 600 dpi. The copying speed is only slightly faster than its competitors on the market, with 16 copies per minute. In a cycle, this machine is able to produce up to 99 copies. The standard paper capacity is pretty good, with 250 sheets. So does the maximum paper capacity, with 1350 sheets. For the power consumption, Ricoh Aficio 2016 is pretty inefficient, with approximately 1.28 kW during operation and 40 watts during energy saver mode. The size is pretty large, but still good enough for small businesses and offices, with 35 kg in weight, and 550 x 568 x 420 mm in width, depth, and height respectively. Download the latest drivers for your: Ricoh Aficio 2016 Printer to keep your Ricoh product up-to-date.